Over the next few weeks you will start to see some ‘Spring’ revisions appearing about the place. That’s because we’ve passed the Very Most’s precious work to some brilliant minds. Their task will be to reimagine the tunes using nothing other than their own brainwaves (and probably some laptops). You’ll be able to hear the fruits of their labour on this very page. 12 Feb: We are delighted to present the first remix courtesy of Rod Thomas. 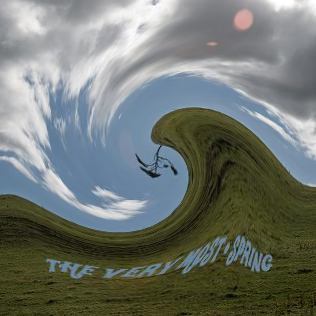 It’s a wonderful take on ‘The Only Pretty Ring Time’ and for a limited time it will be free to all those who’ve already purchased the ‘Spring’ EP (give us a shout and we’ll send it on pronto). Hurry along now. 22 Feb: Remix 2 is the work of Ben Ferris of Nonstop Everything and the Van Allen Belt. And it really does turn out to be a belter take on ‘Today It Is Even Better’. Only the keenest Very Most students will identify the original such is Ben’s radical reinvention of Spring’s opening track. This is free for a limited time to those who’ve already bought ‘Spring’. 1 Mar: Jed from My Teenage Stride makes it a hat-trick of remixes and being the shoegazers that we we are we think it’s pretty great. Jed has put the brakes on the giddy momentum of the Very Most’s original and given us a glorious feedback drenched replacement. This is free for a limited time to those who’ve already bought ‘Spring’. Oh my…this is beautiful! Love it! I do not know what the original sounded like. But I do like this very much. Sounds a bit like Gregg Alexander of the New Radicals. The words btw were used by Gene Wilder in Willy Wonka. Nice work by everyone involved. I am so impressed with the talent inside these remixes….how amazing they have all been thus far. Very cool!!! I look forward to hearing more. You should all be so proud. The remixes are great. A perfect way to start Spring! Puts a bounce in my step.